Nick Schultz | The Phoenix Loyola redshirt senior guard Marques Townes looks to pass to a wide-open teammate against Illinois State Feb. 2. 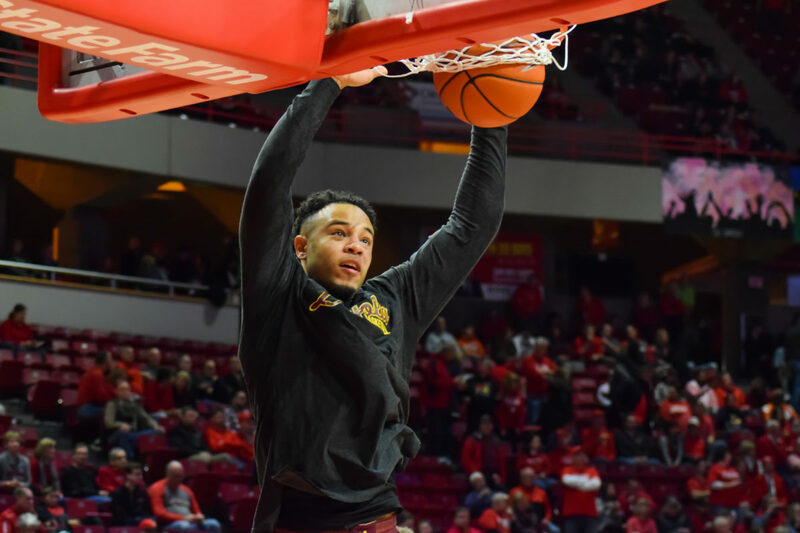 Nick Schultz | The Phoenix Loyola redshirt senior guard Marques Townes throws down a dunk during warmups against Illinois State Feb. 2. 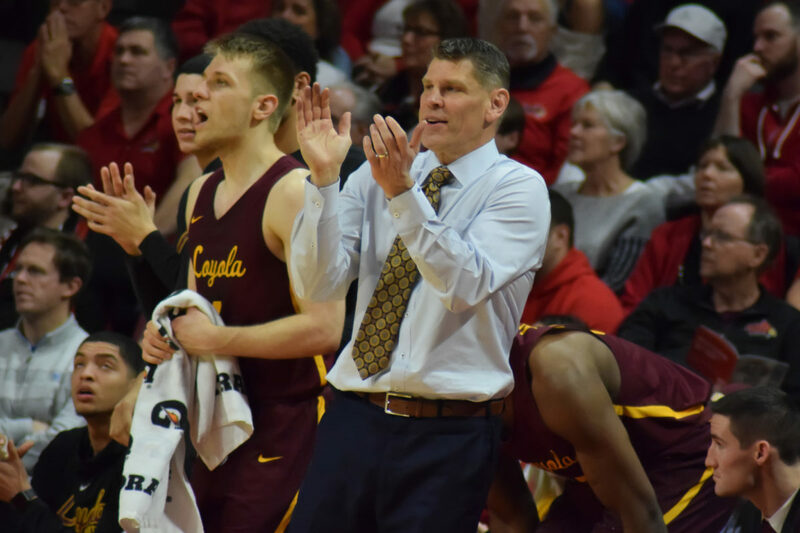 Nick Schultz | The Phoenix Loyola head coach Porter Moser celebrates after a basket. 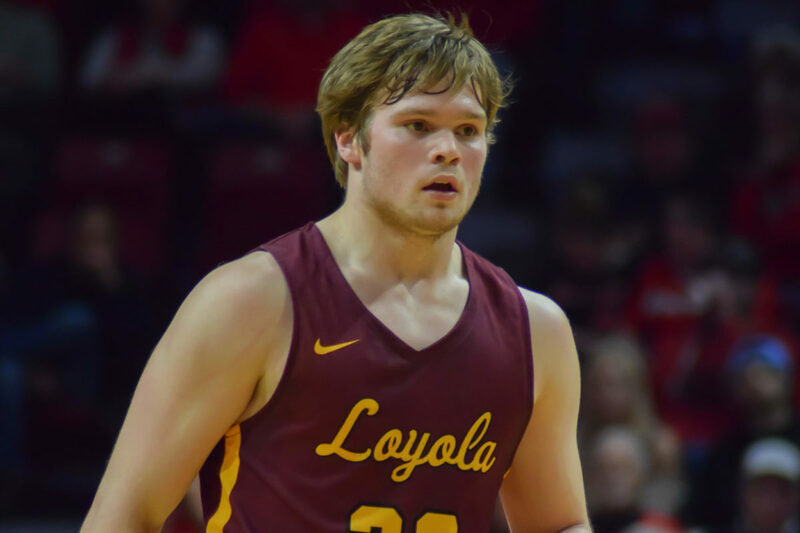 Nick Schultz | The Phoenix Loyola sophomore center Cameron Krutwig looks for an open teammate against Illinois State Feb. 2. 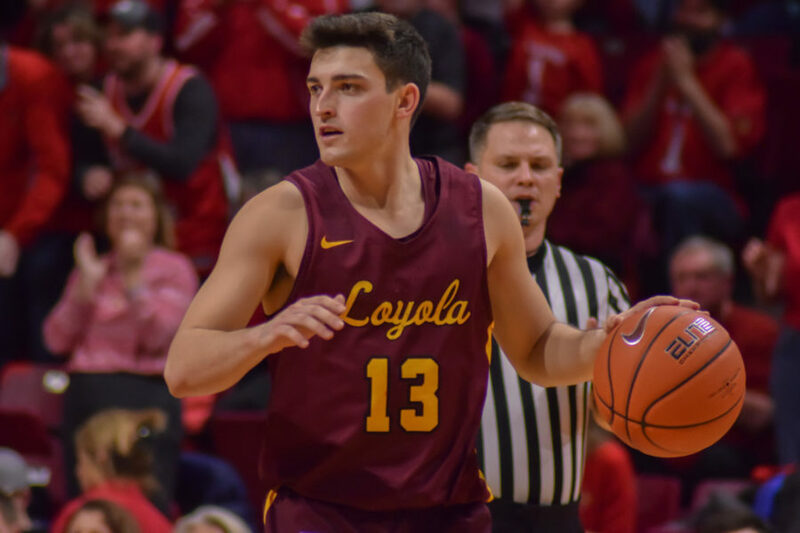 Nick Schultz | The Phoenix Loyola guard Cooper Kaifes had nine points against Illinois State Feb. 2. Nick Schultz | The Phoenix Loyola redshirt senior guard Marques Townes dribbles the ball up against Illinois State Feb. 2. 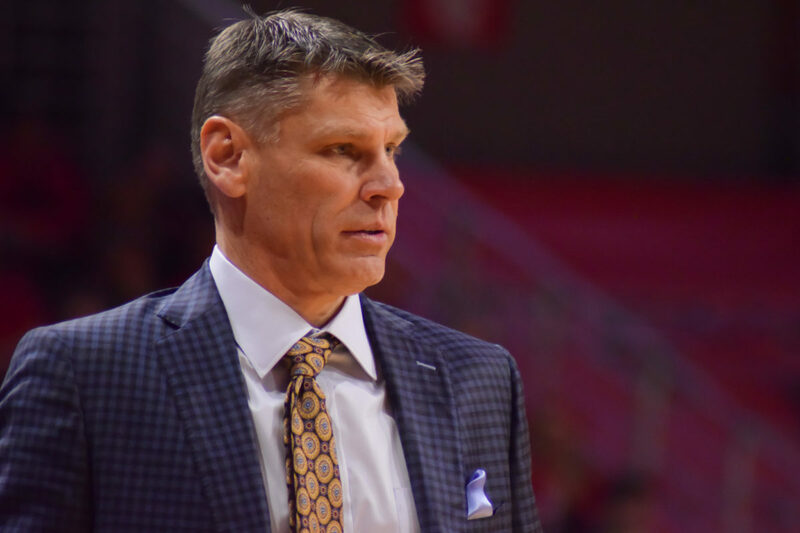 Nick Schultz | The Phoenix Loyola head coach Porter Moser looks on as his team battles Illinois State Feb. 2. 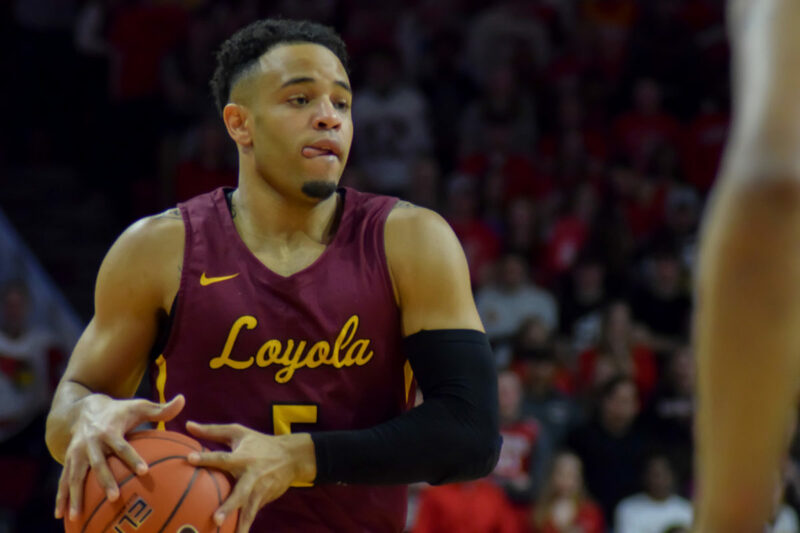 The Loyola men’s basketball team (14-9, 7-3) continued its conference road woes Saturday night as it fell to Illinois State University 65-57 at Redbird Arena in Normal. 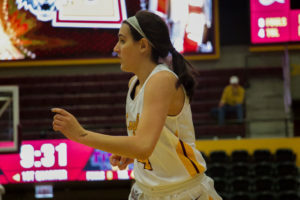 The loss dropped the Ramblers into a tie for first place with the Redbirds after 10 conference games, and fall to 2-3 away from Gentile Arena in conference play. 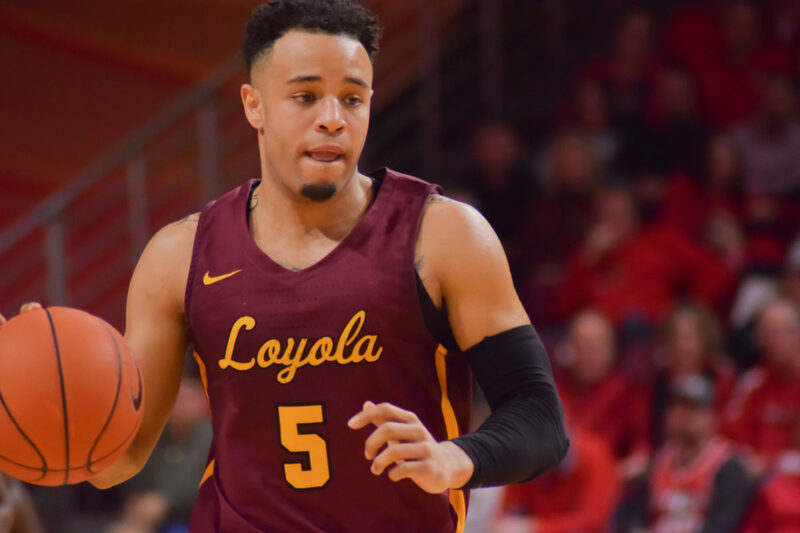 In the defeat, Loyola was led by redshirt senior guard Marques Townes who finished with 19 points. Sophomore center Cameron Krutwig also guided the Ramblers with 15 points and nine rebounds. 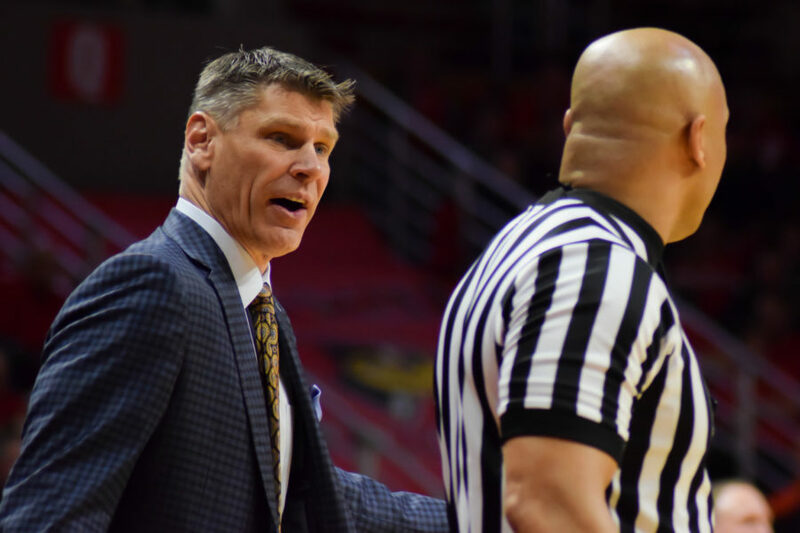 Bouncing back from a 67-64 loss at Gentile Arena Jan. 12 the Redbirds made adjustments to even the season series at a game a piece and tightened the conference race heading into the final eight games of the year. ISU was led by senior guards Milik Yarbrough and Keyshawn Evans who combined for 35 of the Redbirds’ 65 points. In the first half, Loyola struggled to contain Yarbrough as he went 3-for-4 from long range and finished with 15 points. The Ramblers shot 47.6 percent from the field as Krutwig and Townes chipped in a combined 18 first half points. Despite this, they headed for the locker room down 35-25. 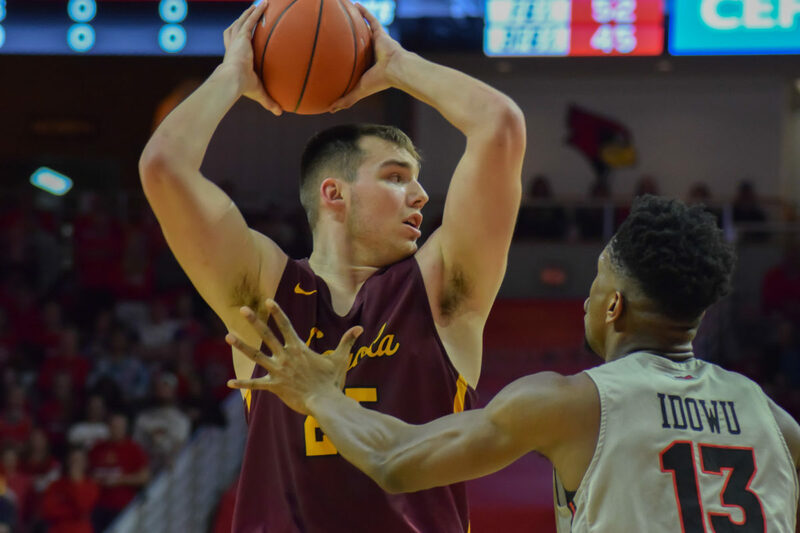 The second half saw the Ramblers struggle to get anything going offensively as they shot only 34.5 percent from the field and couldn’t ever cut the Redbird lead to less than six points. These saw the Redbirds coast to a 65-57 victory as the final buzzer sounded. Nick Schultz | The Phoenix Loyola redshirt senior guard Clayton Custer dribbles the ball up against Illinois State Feb. 2. The Ramblers shooting woes were headlined by their inability to convert from beyond the arch as they finished 5-25 as a team in the loss. Redshirt senior Clayton Custer was the root of these struggles, as he finished with eight points but shot 1-12 from three point range. The Ramblers are headed back to Gentile Arena Feb. 5 to take on Drake University at 6:00 p.m. The game will be broadcasted on CBS Sports Network.